This is a hammered ingot piece. This means that the silver was melted and poured into an ingot, which was then pounded during repeated annealing. The silver was then run through a hand rolling mill to get an even thickness to the silver so that the pieces could be cut from this sheet. 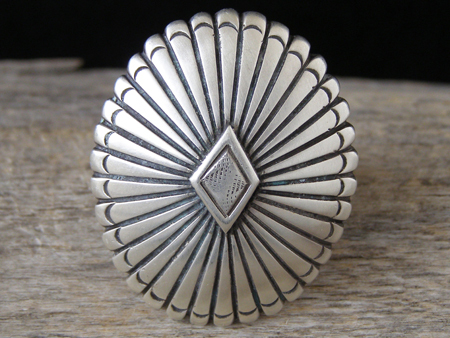 This is a hollow piece with a flat back and domed, convex oval surface. Stylized eagle feathers readiate from the center diamond. Dimensions of oval face: 1 9/16" x 1 5/16"